The Great Whales have become the symbol and focus of Global Environmental Consciousness. Ancient creatures, Whales reflect to Humankind a way of being in harmony with life. They may hold the key to our survival. Whispers of the Whales puts you in touch with the mystery of the Whales. Experience the grandeur and gentleness of the Humpback Whales and playfulness of Dolphins as they come to observe the observers aboard The Oceania Project's Whale Research Expeditions to Hervey Bay, Queensland, Australia. Southern Humpback Whales visit the shallow, protected waters of Hervey Bay between July and November each year as they commence their annual migratory journey southward to their Antarctic feeding grounds. Trish and Wally Franklin have had the unique privilege of observing and gathering new information about the Humpback Whales of Hervey Bay, assisted by those who participate in the Expeditions. Captured on video from atop the 25 metre mast of the Expedition vessel you will view these magnificent creatures of the ocean in ways never seen before and share the experience of those aboard. 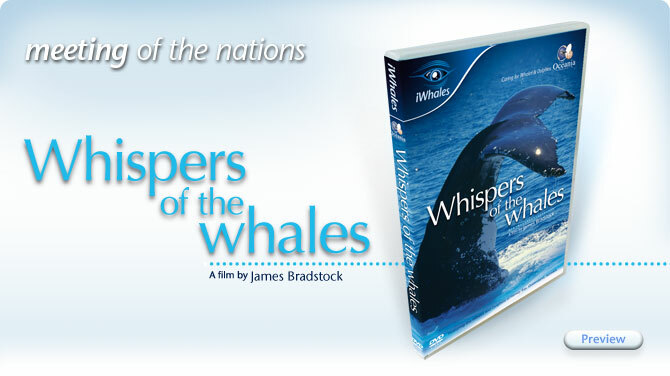 Whispers of the Whales will engage hearts and minds around the Planet to become inspired by the beauty and mystery of the Humpback Whales of Hervey bay.